First, let me just brag about what an awesome husband I have. I got my Mother's Day present early, and I am SO excited!! Totally unexpected! THANK YOU! THANK YOU!!! 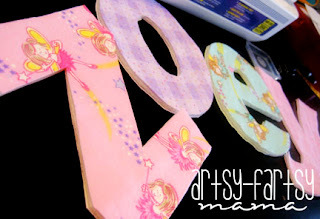 Ok, now on to business :) For my daughter's bedroom, I decided to make her some rag letters inspired by Jessica at Happy Together. Like most of my projects for my daughter, I wanted them to match her rag quilt I made her for Christmas. 1. Print and cut out your letters to use as a template. I typed my own and made them all the same size & font. You could make your own using Word, Photoshop or whatever you have or you could freestyle it. Happy Together also has a pattern you can download. 2. Cut out squares of fabric and quilt batting that fit the size of your letters. 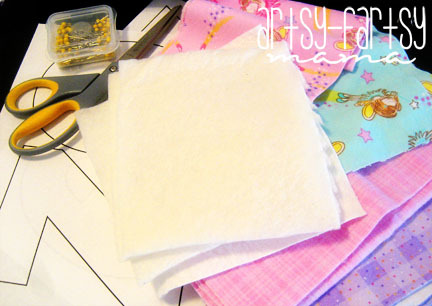 3 Make a sandwich of your fabrics and batting. The back fabric facing right side down, the batting square in the middle, and the top fabric facing right side up. 4. 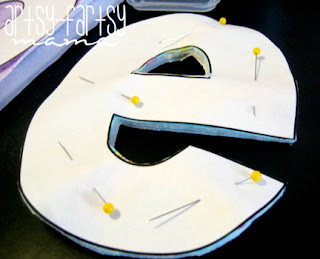 There's a couple ways to do this part, but what I did was pin the letter cutout on top of the square and cut all 3 layers of fabric together (shown in picture below). You could also trace your letter with a fabric pen, pin the layers together, sew on the lines, and trim at least a 1/4 inch seam allowance. 5. This is what the letters look like when they are all cut out. 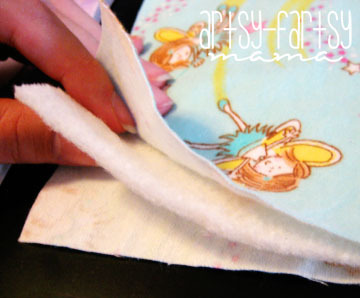 Pin layers together and sew at least 1/4 inch away from the edges. You can also quilt the insides, but they should be fine as-is. So... I am a very beginner sewer... this was my first attempt at sewing one of my letters. Pretty crooked, right? I am embarrassed to even post this picture, but nobody's perfect! Luckily my machine came with a walking foot and I have an incredibly patient mother who was willing to come teach me how to do it the "right" way! 7. Now, get your laundry together and throw your letters in! Washing & drying the letters will give them the "rag" look. Now you can display your letters or give them to your child to learn their ABC's! Cute idea! I have a niece on the way - I should suggest this idea to her Momma! Oh my goodness. I absolutely love these and I think they wouldn't be too impossibly hard to make. Lovely Mother's Day gift. You're a lucky lady. This is such a cute project! 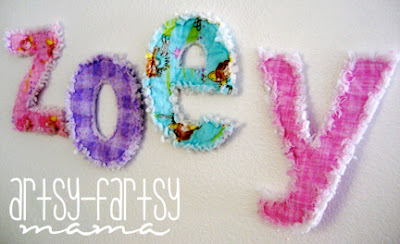 I never thought of making rag quilts into letters! You just taught this quilter a thing or two! Way cute! Very cute! I haven't seen any letters like that. Thanks so much for linking up! These are so great! I especially love the frayed edges! They look absolutely gorgeous Lindsay. I might have to give them a go. I just started a linky party this past Tuesday. It was a great success with over 50 link ups! I would love it if you would participate next week! I realize this project may have taken a little longer, but if you have other quick and inexpensive projects, join us! It's called $10 Tuesdays and it's for things that cost less than $10 and take 20-30 mins (ish) to complete. I love inexpensive and quick projects and I'm guessing others will too ;) Thanks so much for considering. Super LOVE this idea! I'm totally pinning this to do later :) Thanks for sharing!! Cute! I think I'll do an alphabet set for my daughter. WOW! Awesome :) the washing machine really makes them just PERFECT! I may have to try this! what a cute idea! thanks for the tutorial!! these would be perfect for a birthday or baby shower! Love your letters! 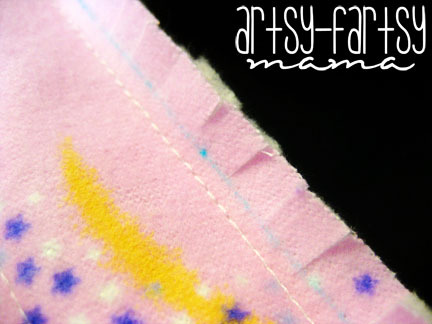 I came from the CRAFT Making Monday Marvelous blog linky! 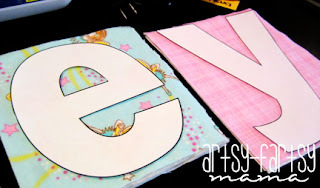 Love these rag letters....What a genius idea! Love these! I am going to link these up to my blog! 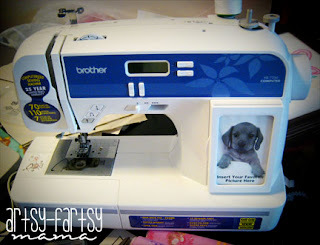 I am looking for easy beginning project for myself as I too got a brand new machine myself!! 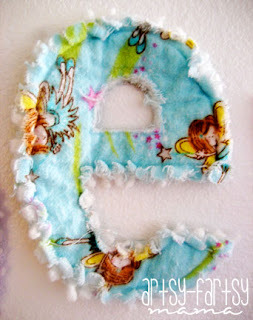 I made her rag letters too! I remember they occupied my hands when I was 3 days overdue with my baby lol, she is 14 months now and plays with them every day! I am visiting from The Girl Creative and I am your newest follower! Beautiful, especially those edges! Plus love everything lettered & monogrammed. i love this! so crafty. im your new follower. I love these.. I just dropped in from "Reasons to Skip Housework Party".. What a great Mother's Day present. I too sew and embroider with a Brother.. Come visit my page.. I would love a follow. I am your newest "follower"
OH MY, I love THESE!!! Great Job! These turned out super cute! I think I will have to try this soon. I love love love this! I have been wanting an idea for my little boy's room, and this is perfect. Thank you. If I get it done, I will totally blog about it and link back up to you! Awesome too bad I don't sew. I really love these letters. They are so cute and hopefully not too much work. I'd love to try them and put them in my kids' rooms! Thanks for sharing. I have to try that!! Its so adorable! Great job! I am featuring this tonight! :) Starting tonight I will be having my link party on Saturday instead of having Inspire me Mondays, so be sure to stop by! :) Have a wonderful weekend! I think you did a great job!! And once you washed and dried them you'll never see the sewn lines! I did a similar project but I just layered up my paper letter outline with my fabric and a layer of warm and natural batting. I stitched right through the paper. The stitched perforate the paper and you can pull the paper off after you sew. This is adorable! I have a sewing machine that I've only used a few times and it's been years, but I've been wanting to pull it out. You inspire me. Thanks! Oooh I love it... been looking for some inexpensive but creative ways to dress up the kid's rooms. Thanks! These are SO cute and original, love them! I love this. I have been looking for a way to put my little girls name on the wall. I printed out the template you mentioned and the letters are only 1/2 a page. How big are your letters? Thank you so much for the inspiration! I just found this on Pinterest! Where did you get your letter templates? I am trying to make them on the pc to print. I am having no success. 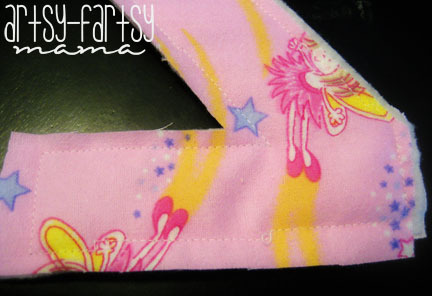 Oh if only I could sew - I would definitely make! Very cute and thanks for sharing. These are so cute. I made them and now the only thing I need to do Is hang them! How did you hang yours?